Mercy Aigbe And Her Husband Have Reconciled? Mercy Aigbe has sparked new rumours again. This one has nothing to do with wearing someone's gown. This time around it's rumors of reconciliation with her estranged husband for the second time. The Nollywood actress gave hints of patching it up with Lanre Gentry after she shared a photo showing her wedding ring on her finger. 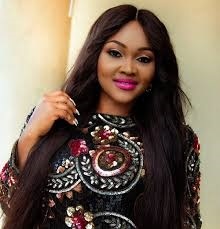 Mercy Aigbe Gentry has been married to Lanre Gentry, a Nigerian hotelier, since 2013; the couple have two children – a daughter and a son, as well as three other adopted children. Mercy broke the Internet with photos and videos which showed how her husband had beaten her up. After it got to public notice that Lanre Gentry was an abusive husband, he was legally charged for his actions and even got sent to prison, and the actress finally decided to break up with him. But it seems the tables have turned this Easter; is Lanre getting a second chance to be a better husband? Totally crushing on my new Nails, thanks @tinaeze348 for hooking me up ????????? ?